...can i get a pair of socks from one ball of yarn? These are part of my mom's "slew of anklets" holdiay gift I'm planning. I "had" to see if I could coax a pair of footie anklets from one ball of the cashcotton, and I was able to (happily). Like I said before, she likes the footie socks so I'm thinking I'm going to try and knit as many pairs of them as I can between now and the winter holiday. I was planning on using a variety of yarn, but I've got to say I really, really enjoyed working with the cashcotton... its so soft and feels decadent to knit with (angora & cashmere). Since I knit the socks at a tighter gauge than recommended (ball band says US 3's and 7 sts/inch, I used US 1.5's and 8 sts/inch) the fabric doesn't feel as luxe as the hand of the yarn itself, but I think that's a good thing for these socks. I say, "this type of sock" because my mom doesn't get around a lot, so these won't see much hard shoe/walking wear... they'll likely be worn in slippers or alone indoors. 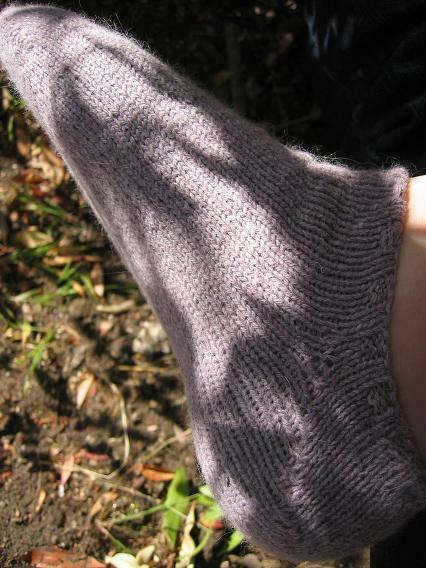 I don't know if I'd like to knit these for myself for shoe wear, *but* they are so soft on the foot and they are also very warm-- a good thing on my hardwood floors. I'll think about knocking myself out a pair or seven once January rolls around. I powered on thru these, taking 2 days of nothing else. Partly it was the race against the yarn, wondering if it'd run out. Partly it was me sleepless and excited at night with empty hands and a warm heart (left me sleepwalking the next day!) I think though its the holiday project thing-- both Erica and anne have written things about holiday gift giving that really touched me and echoed the urge I feel... the more gifts I complete, the more I want to tackle and start new things. I haven't worried (yet) about not finishing things, it almost feels like a given I will. 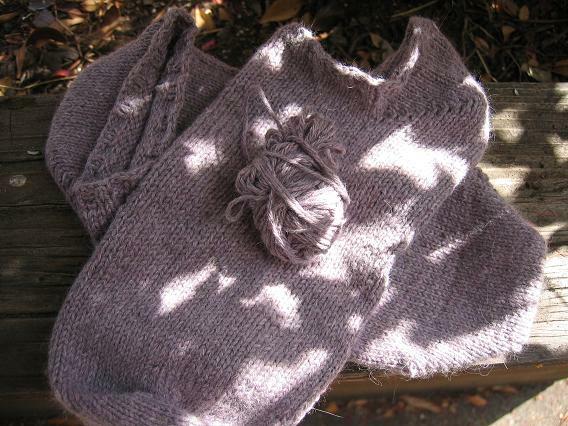 Perhaps this holiday knitting is the cure to unfinished objects, at least for me. taking a cue from dave re: bloglines freedbacking... yo quiero bloglines, really. i have over 400 blogs there in the sidebar and you help me connect with people and the news all over, all the time. for that, thanks. i am a little disappointed lately however with the new update-- namely, i hate hate HATE that i can no longer easily find posts i have marked "keep new" ... it used to be bold and i could scroll thru and find them but now! near to impossible with so many feeds. i also am disappointed at the lack of blogger images within your reader. i KNOW blogger is the one blocking external images, i KNOW that they prolly are doing it so i migrate on over to google's blog reader (all in bed and the little one said... i get it.) i don't want to switch though, i love you b1. can you somehow build a bridge and find some way to display blogger images, instead of just telling me "its them, not me"? we're an image-heavy community and even though i don't use their image hosting for my blog posts, lots of my friends do and i miss miss MISS seeing their pics and it may drive me away from you. thanks for listening, send my love to your mom. Love the footies! My Ma would probably like those. I like sock-socks better. Maybe make myself some of these for next summer, though. Great way to use up small lots of yarn. I haven't succumbed to bloglines yet or any other thing like that. I read the blogs daily on my sidebar, plus I flick through the different KAL lists and ringsurf. I did switch to Flickr finally, though! Comfy looking socks for the ma! Yippee! I actually don't have any problems with your pictures showing up in Bloglines, but I do with other blogs. Not sure what the problem is, and it drives me a little batty. The footies are a great idea and a great gift! You know, I set up a Bloglines account, added about four blogs to it, and promptly abandoned it. Something about blog-stalking is actually pleasant for me, oddly enough. I think it's the joy of clicking one of my sidebar links and seeing a different heading on that blog - I didn't get the same "Oooh! New stuff!" feeling from seeing a blog title in bold on Bloglines. Yawn. I do, however, frequently check Bloglines to see how many subscriptions my blog has. Because I firmly believe that life is a giant popularity contest. Great footies, and greater freedbacking. You got style, girl! Love the footies; they look excellent and are mighty tempting. Thanks for answering that age old question; your sacrifice is appreciated...LOL. Excellent show on the freedbacking -I think we all have a love/hate relationship with Blogger/bloglines and all things related. yum! those anklets look squishy soft. The anklets look great and comfy. And the capelet is coming along nicely too. 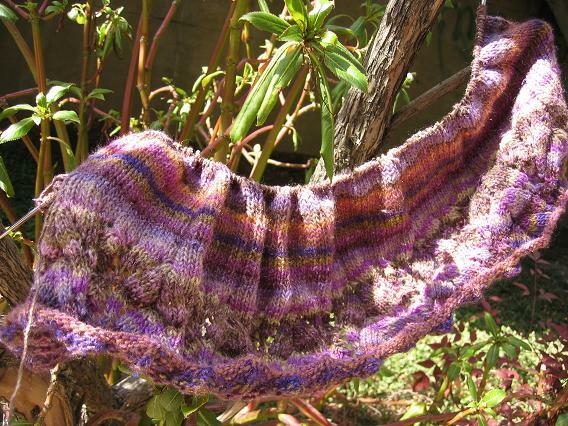 I've never felt Noro Silk, it looks so pretty and soft. Beautiful socks and I enjoyed the closeups of all that fabulous yarn. The footies look great! I'm inspired to try a pair or two for my mom. Although I've owed her a pair of simple black socks for about the last 200 years. Dang! 400 blogs! I feel flattered to get visits from you with that kind of reading load! Those little socks are so cute!! Adorable. And I completely agree with your freedbacking . . .I'm not crazy about the update for the same reasons! The footies look so comfy! Those footies are too cute and they look really comfy too. I use bloglines and I find that there seems to be no ryme or reason to the way stuff shows up. It's very frustrating. Great quick little footies! I made anklets for my first few pairs, and I miss how fast they go! I've heard that the SG softens up quite a bit after a dunk. Ahh bloglines...what can I say? 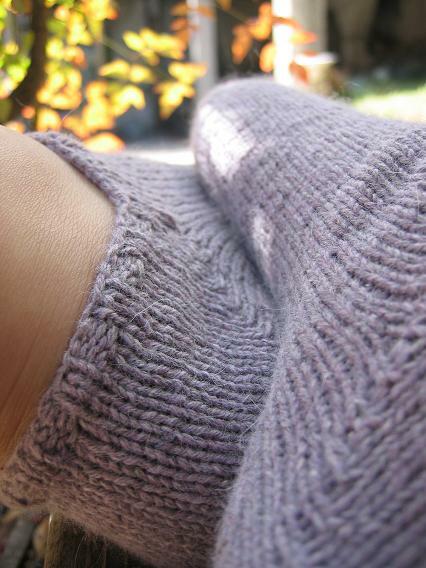 Yes, Silk Garden does a beautiful thing in the wash, it gets soft and fuzzy. I like to make socks with it for my camping boys and around the house when the snow flies. Maybe you will have enough to make Mom some anklets with what I sent you.